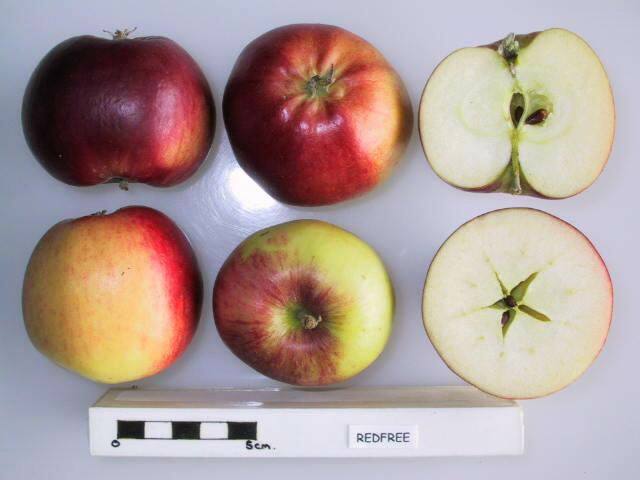 A disease resistant summer apple developed by PRI. The scab resistance comes from the incorporation of Malus floribunda, a crab apple. One of the worst apples I've tried, and I eat at least one apple a day. Soft and flavorless. Maybe I got a bad batch, but will avoid in the future. July 21 and our Redfree apples are ready--crisp and juicy and just the right size for a snack. Many more than we'll be able to eat. My wife is going to dry some, and I'm thinking about getting out the cider press. I don't know what kind of cider they will produce, but I won't know unless I try. I agree with the above. W.P is a better apple, but if you like the snaping texture of crisp (which it holds for a week or so) then this is fresh eating mild apple. Most importantly for me is the Scab resistance. Redfree are nice early season eating apples. The flavor is balanced sweet with a bit of zing but very mild over all. The best feature of these apples are their outstanding texture when eaten out of hand. Redfree apples are a simple refreshing treat that has built disease resistance. I prefer William's Pride to Redfree. W.P. is also an early dessert-quality apple with disease resistance but seems to have something more to the flavor than just sweet. I say try both!